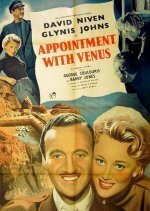 Venus is a pedigree cow that has to be shipped off the German-occupied Channel Island of Armorel by major David Niven in this Second World War comedy adventure. Glynis Johns co-stars and there's a Who's Who of British cinema in supporting roles, including Kenneth More and Bernard Lee (who would later play M in the Bond films). If you can forget the real-life horrors, Appointment With Venus is more than passable. The US title was Island Rescue, which rather gives away the ending, but then who really thought they wouldn't save Venus from the nasty Nazis?